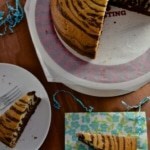 What do you think is the key ingredient for this recipe of Zebra cake? 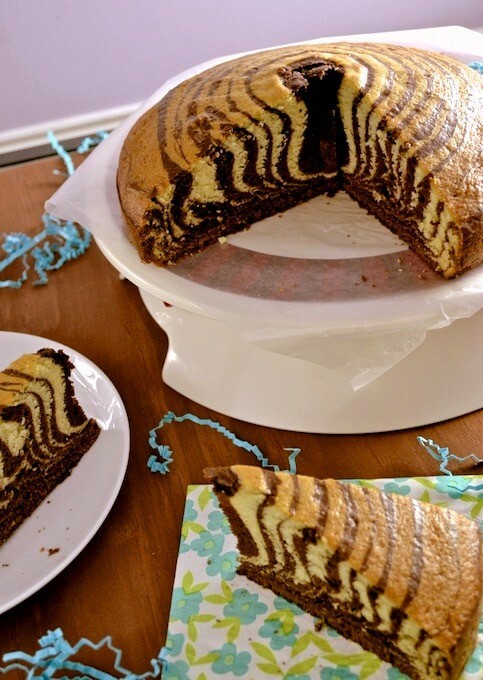 One thing that you would absolutely need to make this AWESOME cake. Flour? Cocoa? Baking powder? Yes, we do need all of these but one thing ranked higher and that was patience. I will happily admit when it comes to cooking, I like to be in and out of the kitchen in less than 30 minutes or less, so when I read this recipe almost 4-5 years ago, I was intrigued but not tempted enough to make it. This year has been different so far and I am pushing myself to get out of my comfort zone more and more and for some reason, this recipe was beckoning me this week. So I decided today was the day when I will take on the challenge and I SUCCEEDED! in spite of me running out of baking powder and my 2-year-old pouring water on my greased cake pan (thank goodness! the batter wasn’t in there). In the end, all’s well that ends well. Give it a shot – and don’t forget to keep patience in your back pocket just in case you need it. This recipe has been adapted from Fae Magazine. 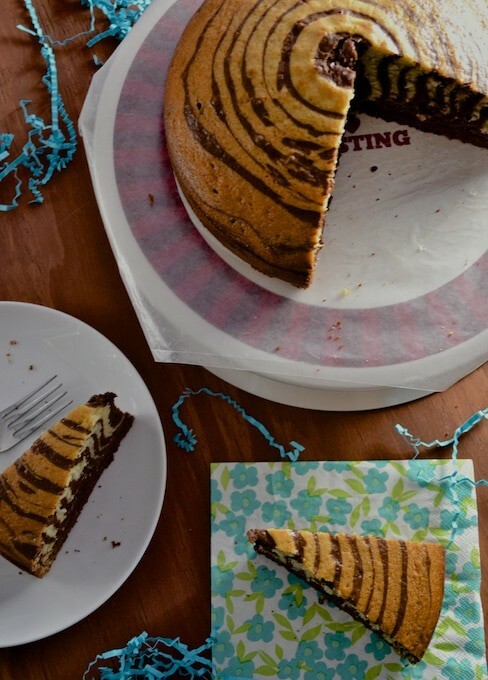 Grease a spring form pan or 9inch round cake pan with non-stick spray and line it with parchment paper. In a medium bowl, add the dry ingredients - flour, baking powder, baking soda, salt. Mix them well with a whisk and set aside. In the bowl of a food processor fitted with a whisk, add eggs and sugar. Whisk them on high until they are combined and turn foamy and light in color (approximately 2 minutes). Add oil,milk and vanilla essence to the bowl and continue to whisk them till they are well combined. Reduce the speed to low and add the flour mixture one tablespoon at a time until all the flour mixture has been added. Stop the food processor, scrape as needed and whisk them again on low speed till it is well combined. Split the batter into two by pouring half of the batter (about 3 cups) into a different bowl. Melt the chocolate chips (if using) in a microwave by heating it for 30 seconds; mixing it and heating it again for 15 seconds till the chips have all dissolved into a gooey chocolate mixture. Add the chocolate mixture and cocoa powder to one half of the batter and mix them till they are well combined. You will need two spoons that can hold around 1/4 cup batter. Always remember to scrape the spoon before adding the batter to the pan. Add a spoonful of chocolate batter at the center of the baking pan. You don't have to wait till it spreads. Immediately after, add the plain batter on top of the chocolate batter. 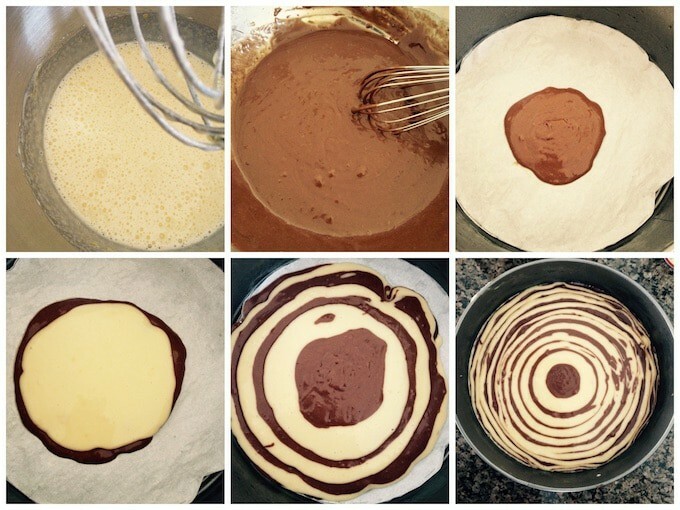 The batter will spread on its own. Add the chocolate batter again in the center of the pan followed by plain batter. Repeat this process until the batters run out, always making sure that you add the batter in the center of the pan. Remove the cake from the oven and let it cool for 10-15 minutes on a cooling rack before inverting the cake onto a plate. Remove the parchment paper and invert it back. Serve warm with coffee / hot chocolate.